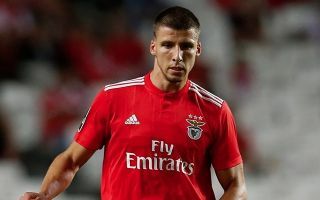 Manchester United are reportedly eyeing moves for Portugal starlets Ruben Dias and Joao Felix. Defender Dias (pictured), 21, and attacking midfielder Felix, 19 both have release clauses in their contracts at Benfica, according to Record. The publication claims that these release clauses are worth a combined £155m – a figure United are said to be willing to pay for the talented duo. Dias is a senior Portugal international with six caps, having made his debut last year. Felix has yet to make his senior bow but has scored four goals in nine Under 21 matches. Dias has started 23 league games for Benfica this season, chipping in with two goals from centre back. Felix has scored nine times in 11 starts and five substitute appearances for the Portuguese Primeira Liga leaders. United have a long history of signing players from Portugal. Cristiano Ronaldo, Nani, Bebe, Joel Pereira and Diogo Dalot have all represented the Red Devils during the Premier League era.